The striker scored a goal in each half to seal a memorable first success for the Colts. Indian Arrows started their campaign with a win as they downed Chennai City 3-0 in their opening match of the I-League played at GMC Stadium, Bambolim earlier today. Striker Aniket Jadhav scored a brace while Boris Thangjam added a third in the last minutes for the Arrows. Coach Luis Matos started with most of the U-17 players as only U-19 striker Edmund Lalrindika made the cut into the Arrows' starting XI, whereas Chennai coach V. Soundararajan utilised all four foreigners as he named Kyrgyzstani defender Veniamin Shumeikho, French forward Jean Joachim, Nigerian striker Lucky Micheal and Solvenian keeper Uros Poljanec in the starting XI. Chennai started well and completely dominated the first 20 minutes of the match by continuously penetrating the rival's defence but could not make most of it because of poor finishing. Joachim had the best chance in the 19th minute when he dangerously moved inside the box after receiving a short pass from Pradeep but shot wide from six yards. 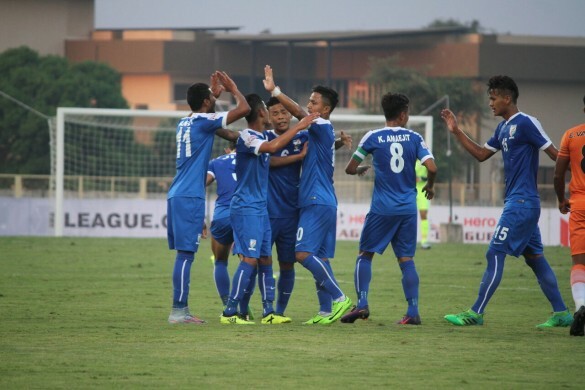 Though Chennai started the match on the front foot, it was the Arrows who came up with the first goal in the very next minutes when Suresh Wangjam found Aniket Jadhav with a square pass. He covered some distance on the edge of the box and tried his luck. The shot finished in the back of the net making it 1-0 for the development side. Two minutes later, Chennai skipper Michael Soosairaj combined well with Pradeep Mohanraj before striking it inside the box but his powerful shot was nicely pushed to safety by Arrows keeper Dheeraj Moirangthem. The next few minutes witnessed two quick attacks from Edmund but first, his chipped shot over rushing keeper Uros missed the target narrowly, while four minutes later, the frontman was denied by the woodwork with every opponent beaten. Chennai once again came close in the last few minutes before the halftime whistle but first, Mohanraj’s long-distance cross was tapped wide by Micheal. A minute later, Charles Lourdusamy came up with a brilliant through pass to Joachim in the box but the striker failed to beat Dheeraj in a one-on-one. On changing sides, Chennai was the first to look at the goal when Mohanraj sent a cross to Massoor Thangalakath in the box but the midfielder headed wide. The Arrows doubled their lead in the 58th minute through Jadhav when Edmund made a darting run, cutting past few opponents including the rival keeper and made a cut-back to the on-rushing striker who shot past keeper Uros from just inside the box to make it 2-0 for his side. Down by two goals, Chennai showed some urgency in attack and came up with two quick chances but poor finishing restricted them from scoring. Chennai’s substitute Gurpreet Singh saw his free-kick hit the outside of the crossbar before going out for a goal-kick. A few minutes later, the French striker wasted another chance from close range as his shot found the side-netting with just the keeper to beat. On the other hand, Arrows should have further increased their lead in the 72nd minute when Suresh found Edmund with an inch-perfect lobbed pass in the box but the striker once again failed to find the net. A few minutes later, Anwar Ali had the best chance to inflate Arrows' lead as Suresh made a perfect cross in the box but the defender failed to direct the ball in the goal as his weak shot went into the waiting hands of the keeper. However, Boris Singh made it 3-0 in the 90th minutes when his shot from inside the box beat the keeper and finished in the back of the nylons. That rounded off the scoring and handed the youngsters a well-deserved three points in their league bow.